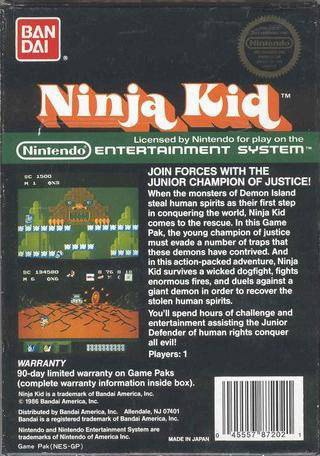 If my memory serves me correctly, Bandai's Ninja Kid was the first NES game I ever bought. I remember looking at the display box in Toys R Us and thinking how cool it looked...I had to get it. 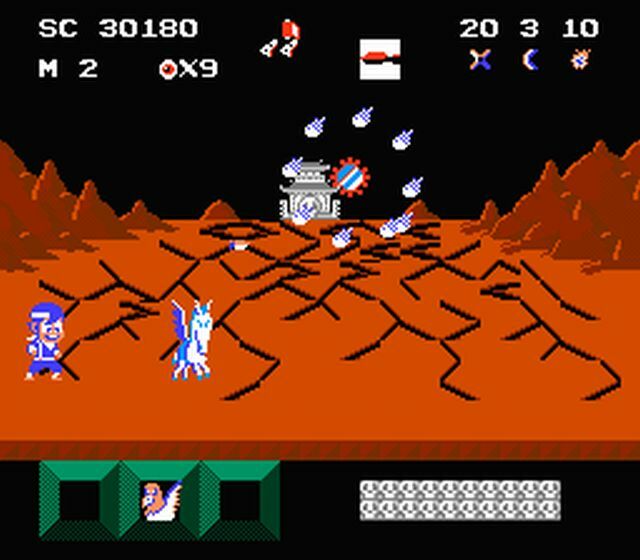 But no one would be able to warn me about how insanely difficult it would be when I finally got to play it. 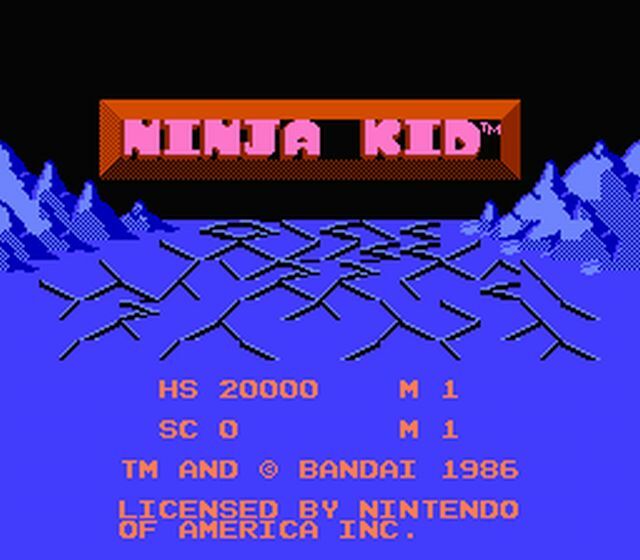 But as hard as it was...there was a lot for me to like about Ninja Kid. 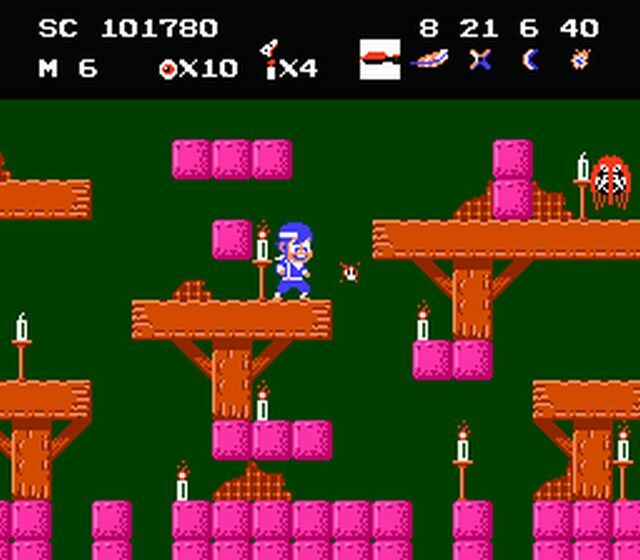 The game had some interesting level designs, including randomly generated maps and levels that would never be the same. Each map had three stages, a shrine and a temple. The stages contained certain levels, such as Guerrilla Warfare, Poison Field, Blazing Inferno, and Dog Fight. You can choose the stage you want to enter, unless one is blocking your path. 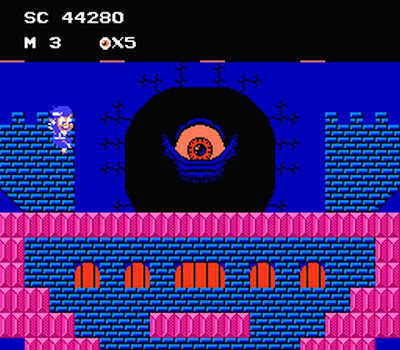 Once inside a stage, there are certain objectives to fill. Collect ten ghosts to get out of Poison Field, kill ten enemies in Guerrilla Warfare or Dog Fight, and light ten candles in Blazing Inferno.The levels are side-scrolling and never end, and enemies will constantly spawn while you are in them. One hit will kill them, but one hit will also kill you as well. This makes for some particularly challenging (and frustrating) gameplay. 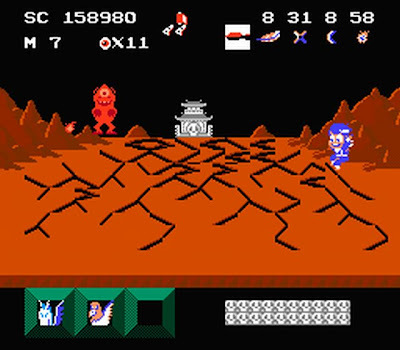 Once the objective is met two exits will appear. 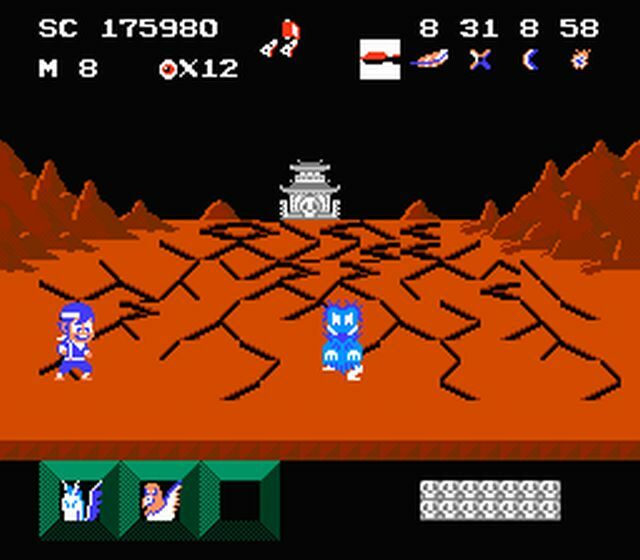 One will lead you back to the map, while the other will lead you to a random mini-boss fight. 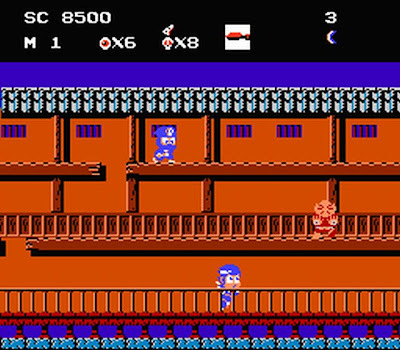 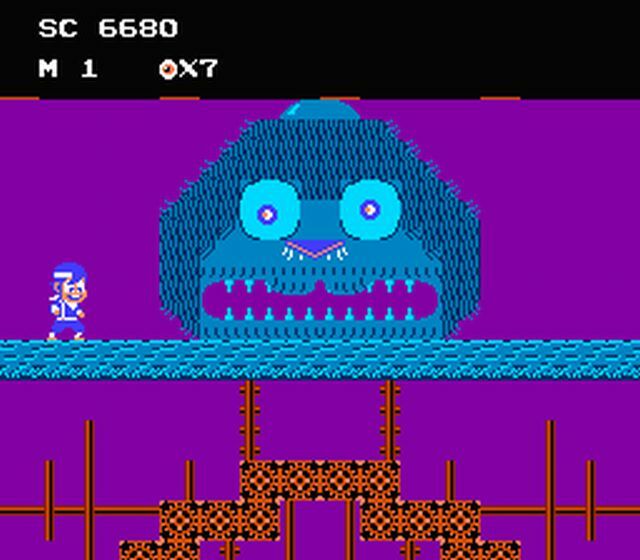 The mini-boss levels are horizontal-scrolling, where you will have to climb up and avoid the falling enemies as well as the attacks from the bosses themselves. 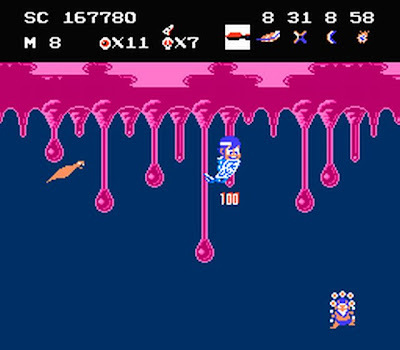 Once you reach the mini-boss, you'll have to shoot them in the right place to defeat them. 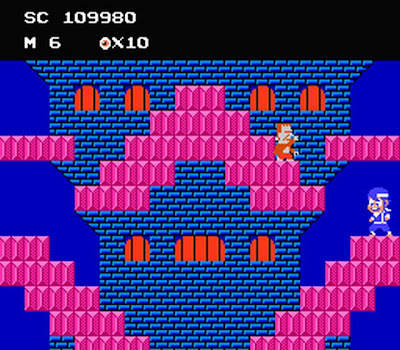 The object of each map is to search for a scroll. The scroll only falls in one stage, and finding it will enable you access to the temple-boss for that map. 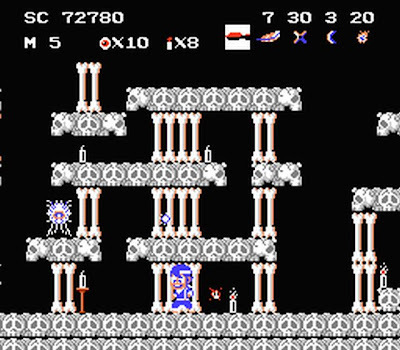 Once you have the scroll in your possession, you can simply skip the rest of the stages if you wish and head right to the Shrine to turn in the scroll, granting you access to the Temple. 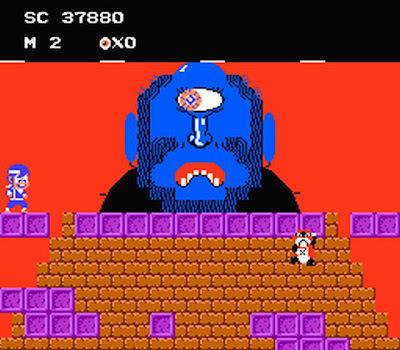 The Temple bosses can be particularly tough to beat, and you'll need to seek help from the available Battle Assistants (Pegasus, Eagle, or Mirror Lady) to defeat them. 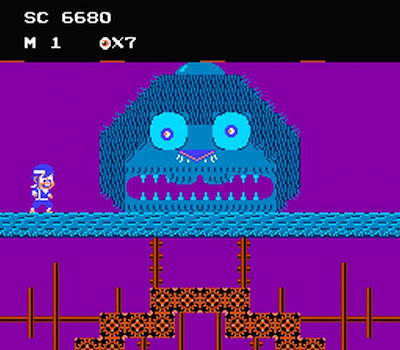 Once the respective Temple Boss of the level is beat, it's rinse and repeat...on to a new map where another handful of various stages await you. 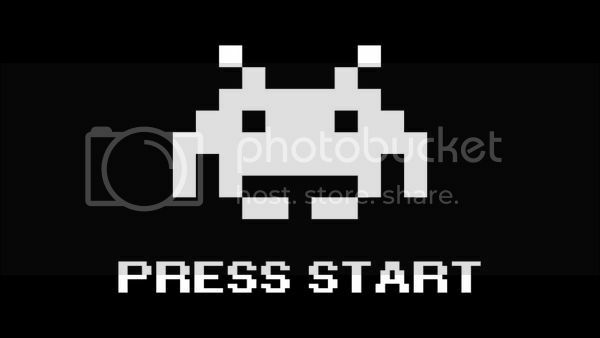 There is no ending to the game. 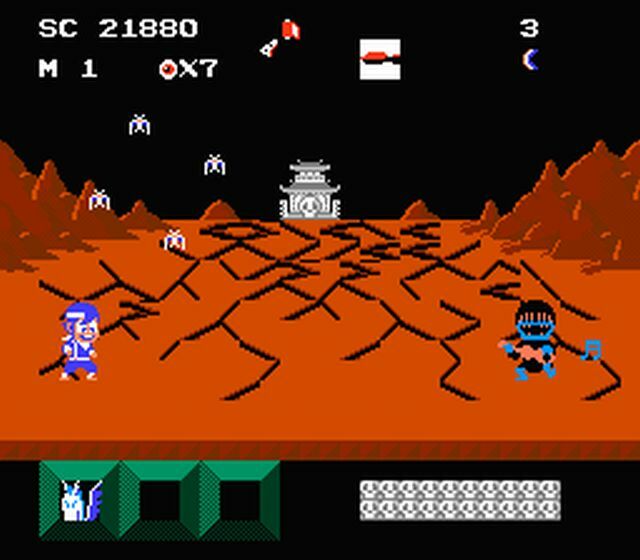 The maps will repeat and repeat until you die, with the main objective to achieve the highest score possible. 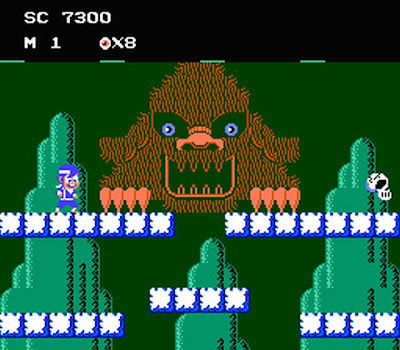 I never knew this as a kid, and I think the farthest I got was the second Temple Boss (floating mirror). That guy always got me...and in the end, I just gave up. 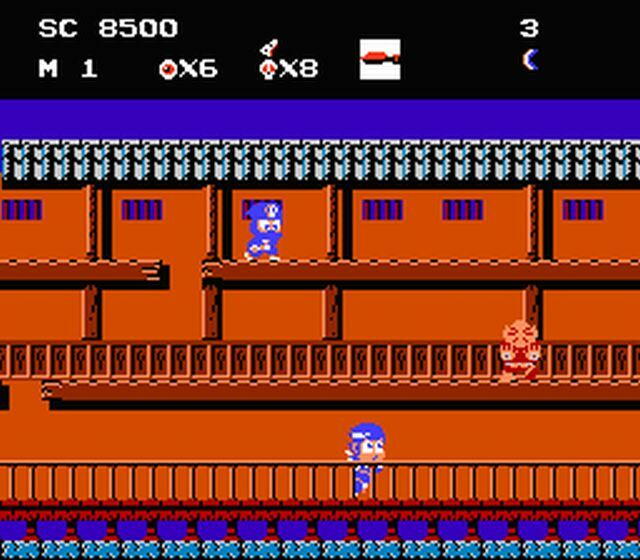 Playing the game for the first time in decades recently, it is still a tough game, and I was only able to avoid frustration and make it to all of the available Temple Bosses by using a little cheat that gave me nine lives instead of three. 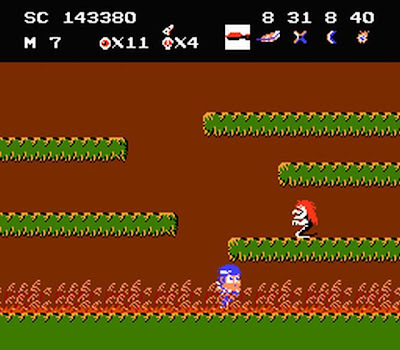 Still, there are a lot of cheap deaths awaiting in Ninja Kid...from the zombies that will jump up out of nowhere in the Poison Fields and kill you instantly, to a flying enemy that might enter the level if you take too long to finish the task. The difficulty may have turned off most gamers back then, but those looking for a decent challenge within the 8-bit platforming realm may want to give this a shot. 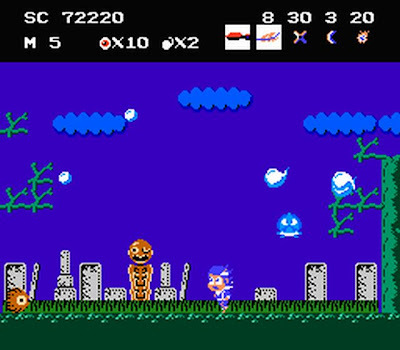 In Japan, Ninja Kid actually existed as Gegege no Kitarou: Youkai Dai Makyou, which was a popular manga series at the time. 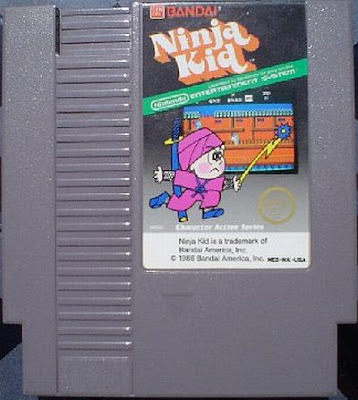 The game mechanics were the same for the most part, but the character looked totally different and had nothing to do with being an actual, "ninja".